You are now leaving the FedTrust Federal Credit Union website. When you click "Continue" below, you will be transferred to a website that is not operated by the credit union. FedTrust Federal Credit Union is not responsible for the content on the alternate site. FedTrust Federal Credit Union does not represent the third party or the member if the two enter into a transaction. Privacy and security policies of the alternate site may differ from those practiced by the credit union. Our Christmas Club accounts are an excellent way to save for the holiday season. No minimum deposit is required to open the account. Members may make deposits to the account on their own or set up a convenient automatic deduction. Christmas Club funds are transferred in Mid-October to the share savings or share draft account. If funds are withdrawn prior to the scheduled transfer date, an early withdrawal fee of $15 will be assessed for each occurrence. Share Certificates of Deposits are offered to members who want a higher dividend rate (some restrictions may apply). The Convenient Money Certificate allows you to make deposits and withdrawals. The Certificates are available in 1 and 2 year terms. The rate is dependent upon whether the member is depositing a minimum of $1,000 or $10,000. Members are allowed to make 1 withdrawal and 1 deposit per month. The minimum transaction amount is $250. If the transaction amount takes the balance below the minimum balance required, a penalty will be applied and the certificate will be closed. Members may save for retirement through this program. It is exactly like any other IRA account and generally pays higher dividends than other institutions. These are offered in the form of accumulation accounts or certificates, whichever the member prefers. I.R.S. maintains very strict regulations governing IRAs and members should consult their tax adviser for deductibility. This account is between a regular share account and a share certificate. The dividend rate is higher than a regular share account, yet it allows the member a limited number of withdrawals per month. There is a $3,000 minimum balance, and $500 minimum deposit or withdrawal. There is not a limit to the number of deposits allowed per month. We also offer a Jumbo ISMA - minimum balance of $100,000 with minimum deposit / withdrawal of $500. Make purchases online and in stores with your VISA debit card. *If you wish to change your PIN on your Visa Debit Card, call 1-800-503-9249. Must have the reference number from your original PIN mailer. Convenient and easy way to save money. Your payroll deductions can be allocated to savings, Christmas clubs, your children's accounts, IRA, money market, loans, etc. The amount of your deduction can be changed at any time. With It'sMe247 Online Banking, you can keep in touch with your credit union accounts any time, from any place life takes you! If you have a computer, smart phone, or tablet, and a connection to the Internet, you can use It'sMe247 to check balances, transfer money, and stay connected with your credit union accounts around the clock. A share account at FedTrust FCU is not only a savings account but also the way to establish your membership in the credit union. Once you become a member, you then become eligible for other credit union products, such as a share draft account, certificate of deposit, loans, and more. Share accounts can also be used as collateral for loans. A Share Secured loan is a great way to establish or re-establish your credit. 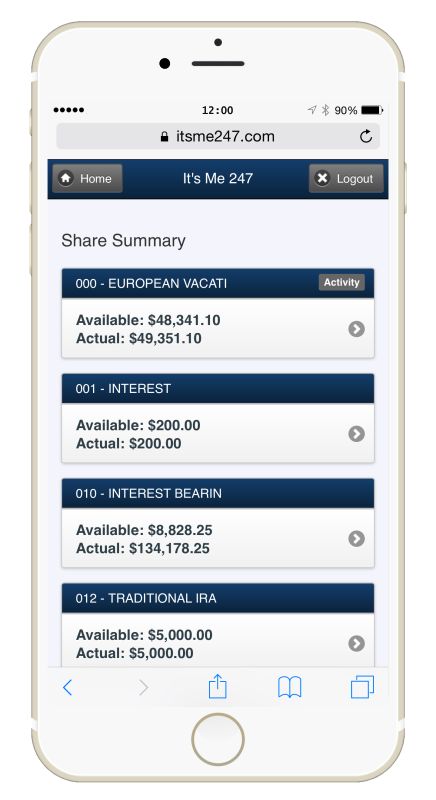 A Share Draft account works much like a regular checking account. At FedTrust FCU, we do not require a minimum balance or monthly service fee. Our checking accounts come with our overdraft protection program. We will transfer funds from savings to checking if the funds are available for a $5 fee. We also offer Courtesy Pay, which will allow checks to be covered up to the amount of the previous month’s deposits or $1,000, whichever is less. You must be approved for a Share Draft account and our Courtesy Pay program. With Visa Platinum ScoreCard, qualifying net purchases made using your credit card earn points. You can redeem these points towards purchasing merchandise, airfare, hotels, travel packages, and more. To redeem your points, simply log on to www.scorecardrewards.com or call Award Headquarters at (800) 854-0790. Our Simple Saver Certificate of Deposit is an easy to way to invest with us. The 1-year term certificate requires a $100 deposit to open and only a $10 minimum deposit each month to maintain.